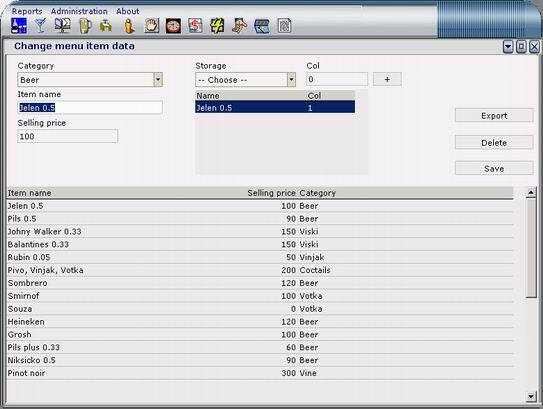 Cafe management software - drink/food menu items administration form. On this form you can create menu items as you wish. 2. Enter selling price for this item. 4. From storage choose which storage item amount will decrease when you selling this item (e.g. Amstel col=1) means that when you sell "Amstel 0.33", in you storage will decrease "Amstel" item by 1. 5. For "Cocktails" you can add multiple storage items with different number to decrease in storage. From this moment you can use this menu item in sink functionality. � NOTE: You can create menu item without using storage items.